According to the Mönch Publishing Group, Chile is said to be looking for an upgrade of the Leopard 2A4 main battle tank (MBT) since 2013. Chile is operating the Leopard 2A4 since 2007, after purchasing an initial batch of 128 tanks for less than €1 million a piece - this low price is understood to be the result of political ties and separate contracts for refurbishment. Later the number of tanks has been increased to 140 and then to 172. The MBTs were modified to the Leopard 2A4CHL standard, which has a modified powerpack. At low air pressure (a result of the high altitude in the Andean mountains) the turbocharger has to make more rotations per minute in an attempt to transport the same amount of air, which will still fail in most cases due to the air being extremely thin. Less air being delivered to the engine will reduce the efficiency of the fuel combustion and increase fuel consumption. As there is less air to transport the heat, several interal engine components and the fuel system will get hotter. The higher temperatures of the fuel system and the higher drive of the turbocharger will reduce the lifetime of said components. This is a common problem with all combustion engines being used at high altitudes. 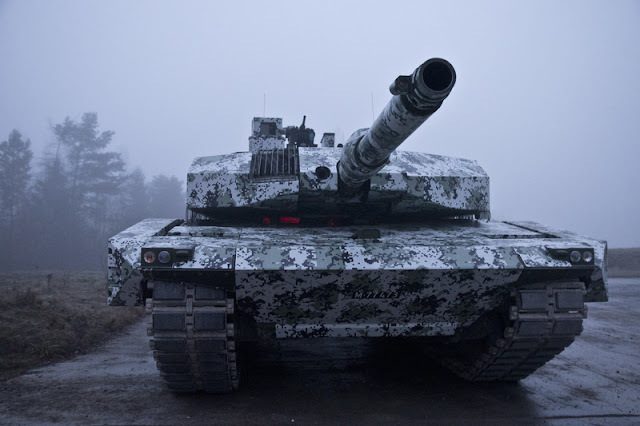 On the Leopard 2A4CHL the German company MTU has installed a special "high altitude kit", which consists of a number of modified powerpack components to deal with the low air pressure and the higher temperatures. If the temperatures still rises above a certain threshold, the engine will slightly throttle in order to prevent overheating. The aim of the upgrade is to reach a technological level comparable to the Leopard 2A5. The upgrade should include electric drives for gun and turret, which are less dangerous than the inflammable hydraulic drives and can offer increased performance. The armor protection should be improved by changing the base armor composition or by adding a modular armor package to the tank. It is also meant to receive upgraded optronics and an improved fire control system (FCS). Mönch writes about a program to digitize the vehicle, which most likely means adopting new digital radio units and a battlefield management system (BMS). Last but not least, the upgraded Leopard 2 tanks are mean to feature a remote weapon station (RWS). The Chilean Army has negoatiated with the three companies KANT, Rheinmetall and RUAG. KANT (Krauss-Maffei Wegmann and Nexter) is a joint-venture of the German company KMW and the partially state-owned French company Nexter Systems. The company is also known as KNDS (KMW + Nexter Defense Systems), the name KANT is understood to have been only a preliminary naming suggestion. 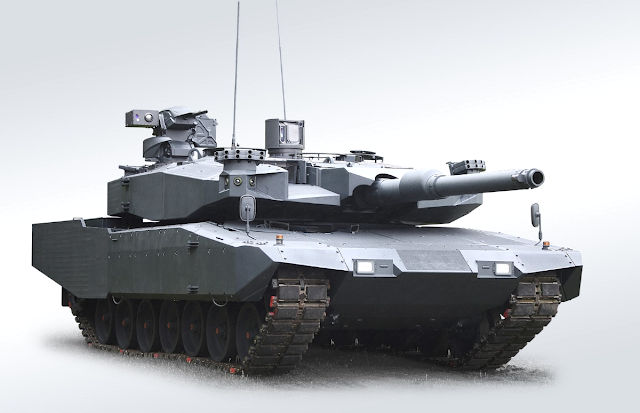 KMW is the original manufacturer of most Leopard 2 tanks and was the main contractor for the Leopard 2 program in Germany. Nexter (formerly GIAT) has manufacturered the French Leclerc MBT. Rheinmetall has won contracts in Indonesia and Poland for the upgrade to the Leopard 2RI and Leopard 2PL configurations respectively. The Leopard 2PL upgrade includes new turret armor, new electric turret and gun drives, an auxiliary power unit (APU) and an improved fire control system, which features new optics and modifications to the gun, allowing the use of high-explosive air-burst ammunition such as the 120 mm DM11 round. 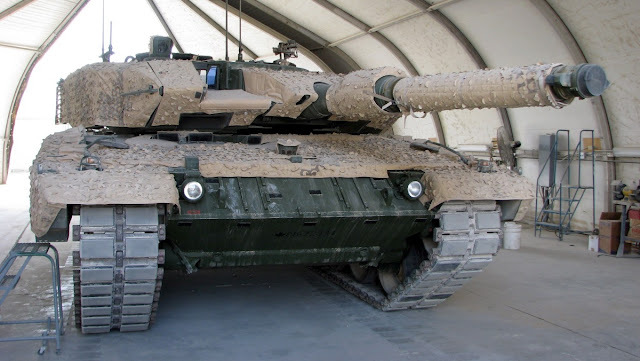 The Leopard 2RI includes a better applique armor kit, which also covers the hull, aswell as an air-conditioning system, but lacks further upgrades to the fire control system (except a module to fire air-burst ammunition). Like the Leopard 2PL, it is fitted with electric gun and turret drives however. Rheinmetall is expected to make use of it's modular MBT Revolution upgrade package; a version of the Leopard 2 Revolution mounting all required components for the Leopard 2A4CHL upgrade will probably be offered. The company was downselected for providing a prototype for the Challenger 2 Lifetime Extension Program (LEP), beating KMW and RUAG among other rival bidders. This might mean that Rheinmetall has an advantage in terms of price or technology compared to the other contenders. KDNS is in theory capable of using it's complete product range and thus include technology used on the French Leclerc tank; however the production lines for the Leclerc have been retooled and the tank is out of production. Nexter will modernize the French Leclerc tanks to the new Renové standard for assymetric warfare, but it seems rather unlikely that KDNS will react to the Chilean tender in its whole entity. It seems more likely that only Krauss-Maffei Wegmann will propose an upgrade for the Leopard 2, offering system similar to the ones purchased by other nations. The main question is wether KMW will offer a Leopard 2A5 variant or an upgrade kit similar to the Leopard 2A4M? Offering an improved Leopard 2A5 (mounting the FLW-200 remote weapon station and a battlefield management system) seems to be a obvious offer to Chile, if the Chilean Army demands an upgrade of the tanks to the Leopard 2A5 level. However the Leopard 2A5 upgrade is a deep modernization, which requires cutting and welding of the original turret and hull structures. This makes the upgrade rather cumbersome and probably also expensive. The Canadian Army received a total of twenty Leopard 2A4M tanks. Unlike the Leopard 2A5, the base armor composition of these tanks remains unaltered - instead additional armor modules are installed at the tanks surface. At least Rheinmetall and RUAG claim that their applique armor kits reach a protection level equal or better than the original Leopard 2A5; it seems plausible that KMW can also offer an applique armor kit to boost the Leopard 2A4 protection level to an equal or higher level than provided by the Leopard 2A5's armor. The Leopard 2A4M itself does not include all features wanted by the Chilean Army, but other KMW-made Leopard 2 variants feature a RWS, a BMS and improved optronics. KMW could simply combine the features from these tanks for an offer to Chile. The Swiss company RUAG has been rather unsuccesful on the tank market. This might be the result of the company being a smaller player in the armored vehicle market, but might also be affiliated with the offerings of the company. RUAG modernized the Swiss Panzer 87 (Leopard 2A4 tanks) in cooperation with KMW to the new Panzer 87WE standard. While original plans saw the adoption of a mine-protection kit, a modular 360° armor package including anti-bomblet armor at the roof, a battlefield management system, improved optronics, a remote weapon station, an engine muffler, electric gun and turret drives aswell as a rear-drive camera, the final tank included only a fraction of these features due to bugdet constraints. At least one prototype of the Panzer 87WE also included the longer-barreled L/55 gun from Rheinmetall. RUAG also has won a contract for the modernization of Austrian and Belgian Pandur 6x6 wheeled vehicles, but it is not known if there were any other bidders involved. Currently RUAG is offering the Leopard 2 Midlife Upgrade (MLU). This modular upgrade concept appears to be similar to Rheinmetall's MBT Revolution concept. It includes enhanced survivability by using SidePRO-ATR armor and electric drive systems. The tanks internal systems are fully digital and includue a new battlefield management system. The MLU also includes a new commander's sight with integrated thermal imager. Currently Chile has probably the best equipped land forces in South America, so it is a bit odd to see them pushing for even more upgrades. The neighbouring countries currently have noticably worse tank forces, even when compared to the very basic Leopard 2A4. Argentina only has light tanks and the Tanque Argentino Mediano (Argentinian medium tank; TAM). The TAM is currently in the process of being upgraded, but still lacks a lot of features to be considered superior to the Leopard 2A4 - the 105 mm main gun and the thin armor are in most cases not sufficient. Meanwhile Peru has been searching for a new MBT since a few years, but has yet to make a decision. While several options were considered - including buying the US Abrams tank, the Ukrainian T-84M or second hand Leopard 2 tanks from the Netherlands - the Chinese MBT-2000 (VT-1A) was selected by the Peruvian officials, the order was however canceled shortly after. Currently China is offering the VT-4 (MBT-3000) tank to Peru. Interesting that the Chileans are now encountering similar engine problems to the South Africans. Transitioning to Continental turbo-diesels in the two Olifant Mk 1 versions was a non-trivial upgrade process with the same issues (thin air and high temperatures in the South African escarpment). Upping power in the Mk.1B was particularly problematic, going from a relatively modest 750hp to ~850hp.